Hygge (pronounced hoo-gah) is the latest concept that we're all falling for. Hailing from Denmark, hygge describes the feeling of cosy contentment - think candles, thick knitwear, fluffy blankets, roaring open fires, neutral tones and stylish furniture. 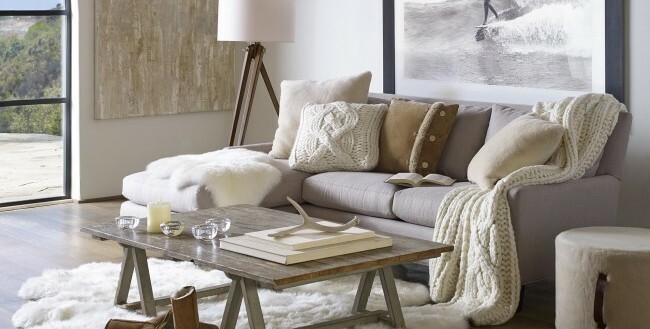 Typically, Scandinavian interior design is minimalist and incorporates a range of natural shades and wood finishes. The beauty of this style is that it is very versatile and can look great all-year-round by simply incorporating little touches to make it snug for Autumn and Winter, and cool for Spring and Summer. When it comes to flooring, wood is the most popular option for this particular style. Often expensive and hard to maintain, why not try wood-effect tiles as they cost a fraction of the price and are easy to keep clean. These tiles don't just have to be for bathrooms and kitchens; they can be fitted just about anywhere which is great news if you want a fluid look throughout the home. There are plenty of finishes to choose from and ones with a white wash really fit with the hygge theme. Opting for a log burning stove, or one to that effect, will really add a homely feel to the room especially with real logs on display. Try a fur (faux of course) rug for extra warmth as well. Nordic kitchens tend to be fairly minimalist with natural hues such as off-whites or treated wood. Hints of pattern are often introduced in order to add a wash of colour, but nothing too garish as a clean looking environment is very much key. This 'Frozen' tile would be perfect for a splashback and the varying delicate patterns mean it would look beautiful in any season. Making your room tranquil and inviting is vital when bringing the hygge theme into bedrooms. Although the room should be painted in pale tones, flushes of colour can be introduced by using accessories such as throws and cushions. The floor should again be neutral, however, instead of wood try large format tiles in a light grey. Using this size also opens up the room and requires less maintenance – hurrah! Keep the accessories neutral as well; try matching towels and bath mats with or without a faint pattern. For those you like some greenery in their bathrooms, bring the outdoors in by featuring small plants that can withstand humid bathroom environments. Real Stone and Tile is guaranteed to have something for your hygge needs. Our experts are always on hand in our Cheadle showroom to help you create your dream home. Stop by today.